Sit back, relax, and enjoy a mojito, Burn Notice is back for it’s season five premiere! 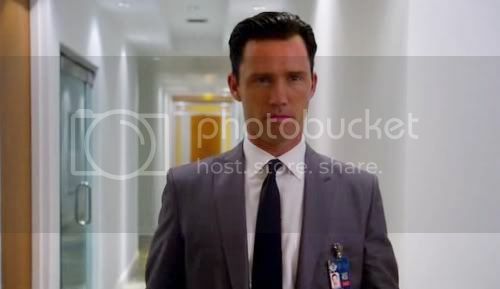 We join our favorite burned spy, Michael Weston, working with the CIA to bring in the people on the list that they worked so hard to get last season: the list of names who were part of burning Michael four years ago. While Michael’s not officially back in, he’s a CIA asset and that’s as good as it’s going to get for now. (If you’re looking for a little insight into this, check out the new graphic novels that USA is putting out every week) We watch Michael and his new “partner”, Max, take down another name, Hector, before he’s sent back home to Miami and the loving, yet rough, arms of Fiona. After his love-making session with Fi we find out it’s been six months from when we last left off in the season four finale. What has everyone else been up to these last six months? Madeline has been redecorating, Sam’s back in fighting shape, and Jesse has quit the government job to work in private security -- after working with the team last season going back to his old job just wasn’t the same anymore. During this short visit to his mother’s house, the boys present Mike with a present, the still destroyed Charger, but before the tarp can be pulled back Mike gets the call back to Washington. Michael is called back in to interrogate Hector, who’s not giving up the information they need to Max. After unplugging the camera, and the secret second camera, Michael rolls up his sleeves as if he’s going to get down to some bloody business, but instead sits and has a private chat. He convinces Hector to give them the location of John Kessler, the last name on the list. Michael, so close to the goal that he and his friends in Miami have been working on for four years, tells the CIA he wants Sam and Fi in on this mission with them. After some argument they agree and the team heads down to Venezuela. This is where I believe the main back and forth of this season comes into play: our way vs their way. In Miami there wasn’t a book to play by, but when working with the CIA you have to obey and of course Sam and Fi aren’t very fond of that. This conflict first comes into play when they ask Sam and Fi to create a distraction while Mike pulls out his Russian persona to gain an asset. Max gives them their cover ID’s, instead of letting Sam use his good old standby of Chuck Finley, which of course doesn’t sit will with Sam. Later while it seems as if Michael’s cover is blown, Max is ready to send in an extraction team but Sam and Fi convince them to wait and let Michael do what he’s best at, working himself out of a corner. To top that all off, they wouldn’t let the duo participate in the final op, instead Max ordered them to watch the baggage at the airport. If they keep having to work with the CIA more this season, they could very well unintentionally jeopardize Michael’s goal of getting back to where he was before being burned. Of course, things don’t go exactly to plan and Kessler saw them coming, he blocks Michael and Max’s signal while he ambushes the rest of the team. Luckily for those involved Sam and Fi refused to just watch the baggage at the airport and were able to help keep almost everyone from being killed. Kessler escapes back to his compound with Max and Mike in hot pursuit. Kessler then takes refuge in a saferoom in the house, which Mike easily breaches using three grendade cores. However once again the truth slips through Michael’s fingers as they discover that Kessler has taken his own life. Following the discovery of Kessler’s death, Max points out the harsh truth to Michael -- This isn’t the business to be in if you want to find answers and have everything wrapped up neatly in the end for you. Michael doesn’t have time to process this loss though as they need to get out of there before the police surround them, leading to my favorite spy solution of the episode: a gun + oscillating fan = distracting cover fire to prevent the police from making a perimeter and trapping the men inside. After the narrow escape the gang meets up over beers to celebrate a job well done. Michael is still obviously shaken by a lack of closure and answers that he has been so desperate to find over the past four years. We end the episode with Michael and his mother having a heart warming talk in the garage. She reassures him that nothing is beyond saving, encouraging him to try to fix the wrecked Charger. However, one has to wonder if he took this advice another way and will continue to try and find the answers and the closure that he doesn’t just want, he needs. I’ll admit I was a bit worried what would happen to the story with Michael being pulled back to the CIA at the end of season four. However using him as an asset while he in essence earns back his status will allow us to continue to enjoy the on-the-fly antics back in Miami. I also liked leaving Miami for Canada and Venezuela, so perhaps the show is going to start to adopt a more worldly view as there are only so many drug runners you can foil down in Miami. They may even head out of the city and state to help friends in need, maybe even going to visit his brother and his family in Vegas. 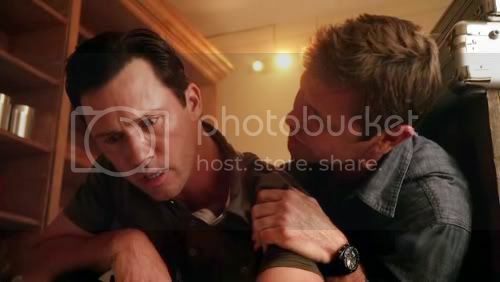 Burn Notice goes Vegas? Count me in. There wasn’t a lot of Jesse in the episode, aside from him showing up in the beginning, which I wonder if was in some way due to negative fan reaction. However, I assume if they’ll be helping more people around Miami he’ll show up again, how important he’ll remain to the main team is to be seen. I also think Max is an interesting addition to the cast, he doesn’t exactly see eye to eye with Michael but he’s not a villain either. We’ll see how long he ends up surviving in a world where almost everyone who works with Michael ends up dying, usually in a fiery explosion. During the episode and on the official twitter I noticed that the big tease for this season is Michael and Fionna take a big step in their relationship this season. 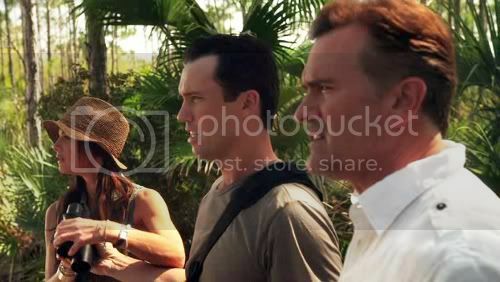 Unlike most shows where the leads getting together tends to kill the show, on Burn Notice there never really was any other serious love interests or rivals for the pair from the beginning. While they sort of teased the idea of Jesse with her last season, the way she jumped Michael’s bones this episode that appears to be off the table. So if this big step is an engagement, I think the couple has gone through enough paces together that it would be earned and wouldn’t make people uninterested in their relationship. While I wouldn’t say it’s kicked the season off with a bang, it was a solid episode which introduced us to where the show stands with Michael back in the CIA’s good graces.